This page provides a video archive of presentations at the annual SSEP National Conference by student researchers whose experiments were part of the SSEP Mission 9 to ISS Endeavor experiments payload. Mission 9 to ISS was the eleventh SSEP flight opportunity. Endeavor is expected to launch on SpaceX-10, NET (No Earlier Than) February 2017, from Cape Canaveral Air Force Station, Florida. Endeavor is also slated to return to Earth on SpaceX-10, splashing down in the Pacific off the California coast, after likely one month aboard ISS. 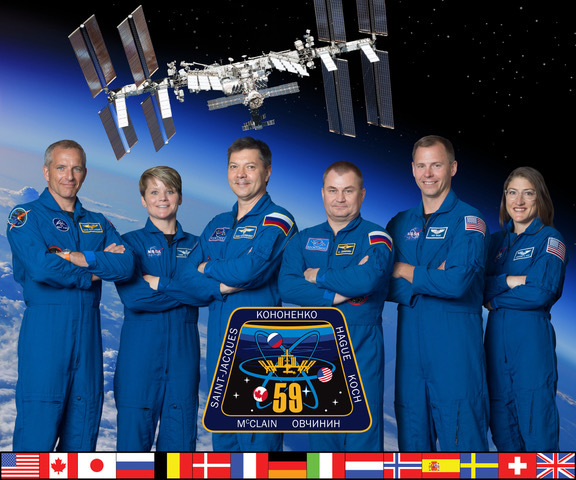 For details on the flight profile for Endeavor, see the SSEP Mission 9 to the International Space Station (ISS) page. Some student flight teams present at more than one annual conference, reporting out status at various stages of the life cycle of a flight experiment. It is also true that not all student flight teams attend a conference. For details on all Endeavor flight experiments, see the Selected Experiments on SSEP Mission 9 to ISS page. Abstract: This experiment is designed to monitor the growth of Ryegrass seeds in microgravity compared to the ground truth. Ryegrass seeds embedded on a gauze growth chamber will start the germination process by the release of water on day U-14. Concentrated salt solution will stop the growth five days before the lab returns to Earth. Analysis will include the number of germinated seeds, direction and length of root growth, and change of mass compared to the ground truth. Abstract: Turbidity is the measure is the measure of light that can pass through a water sample. Cornstarch is obtained from the endosperm of the corn kennel. In regular gravity, this non-Newtonian fluid is hard when you hit it hard or fast, but when you operate in a slow motion it acts like a liquid. When left to settle, the mixture separates somewhat due to gravity, so we were curious if microgravity would affect the initial mixing and then its settling. Abstract: Our experiment’s purpose is to provide information to the scientific universe about growing stable food sources in microgravity without danger. Phytophthora infestans, or the late potato blight, devastated the past. Now that humanity dares to live in space, there is a potential for it to once again wreak havoc. Our experiment tests whether Solanum tuberosum (or blight-resistant potatoes) remain blight-resistant in space by exposing S. tuberosum to Phytophthora infestans. Title: What are the Effects of Amoxicilin on E.coli in microgravity? Abstract: The experiment was designed to investigate the effectiveness of amoxicillin in combating E. coli in a microgravity environment compared to the Earth ground truth. Protocols stated that amoxicillin would be introduced into E. coli tainted water in the type 2 FME mini-lab. Title: What are the Effects of Radiation on DNA in Microgravity? Abstract: The purpose of this experiment was to test the effect radiation has on DNA in microgravity. We learned that the methylation of DNA can sometimes lead to cancerous cells. The plan was to observe how the DNA in cells react to the radiation found in space. The knowledge gained from this experiment would help protect people who travel into space in the future. The knowledge gained from this could show if cancer would affect those living in space. Title: Does Microgravity have an Effect on the Disintegration of Kidney Stones in Chanca Piedra? Abstract: Through our concern about the tendency of astronauts to develop kidney stones, we designed an experiment to test whether chanca piedra would effectively dissolve kidney stones in a microgravity environment. We wanted to keep the treatment as natural as possible. We used artificial calcium oxylate kidney stones, grown ourselves, to determine the appropriate amount of chanca piedra solution, then provided a fixative. We duplicated this for our ground truth experiment. We will be looking for differences between the two experiments. Abstract: Establishing a sustainable colony on Mars begins with exploring the effects of the perchlorate ion in Martian soil and microgravity on crop seed germination. Our Type 3 FME mini-lab will contain Martian simulated soil with Solanum lycopersicum seeds. Distilled water will be introduced to catalyze germination and after twelve days, 10% Neutral Buffered Formalin will be added to suspend any further development, allowing us to determine how plants that have evolved on Earth will respond to harsher alien conditions. Abstract: Our experiment is to see whether Arabidopsis thaliana will germinate in Martian soil simulant in microgravity. Other researchers have shown A. thaliana grows in Martian soil simulant, but the lower gravity of Mars cannot be simulated on Earth. Hence, we are using the microgravity in the ISS as an approximation of Mars’ lower gravity. We chose this experiment because of the recent news about water on Mars, and we are hoping this could help future settlers grow plants on Mars. Abstract: Our experiment would give more knowledge about bacteria behavior in space. For our experiment we are going to use a Solanum tuberosum (potato) and put it in contact with the bacteria, Pectobacterium carotovorum. When humans grow plants off world we need to know what precautions to take so the plants stay healthy. On Earth the bacteria would break down the potato’s cell structure, but we don’t know what will happen in microgravity. Abstract: Our project aims to study hydroponics plant germination in microgravity. Hydroponics is growing plants without dirt, and with just water and fertilizer. Our goal is to investigate if hydroponics will be able to germinate in microgravity and low-pressure conditions in space. The results of this experiment can help astronauts harvest fresh food while in space. Our ground truth experiment used alfalfa and medallion seeds and fertilizers, growing in rockwool cubes.